Actually, in northern Vermont, spring comes so softly it's almost invisible! Often more a feeling than anything you can see or touch, like the smell in the air—damper, less frigid-- and the brightening and lengthening days. It's also sap trucks going up and down our hill full of amber syrup and, of course, mud. Unless you've personally experienced the fabled New England “mud season” on our dirt roads, you have not got a clue how challenging they can be! When I first moved here in 1992, one April--on an achingly beautiful early spring day--I set out in my little Nissan Sentra to explore some back roads in a neighboring area, hoping to shake free of a long winter's cabin fever. I soon realized with horror that the undulating sea of dark muddy ruts ahead of me was not going to end soon-- in fact, there were miles yet to travel before I reached terra firma! The fine gentleman who had sold me that Sentra laughed later when I related my tale to him. He ran a garage with a tow service and he said that in mud season he just parked down at Maple Corners in Calais and towed car after car to dry land and collected his fee. Mud season was good business for him! We Vermonters are so practical. But a lot has been happening in my workshop so today I thought I'd kick off my March blog posts by showing you some things I've been working on. I was very pleased to receive an Etsy order for three (!) 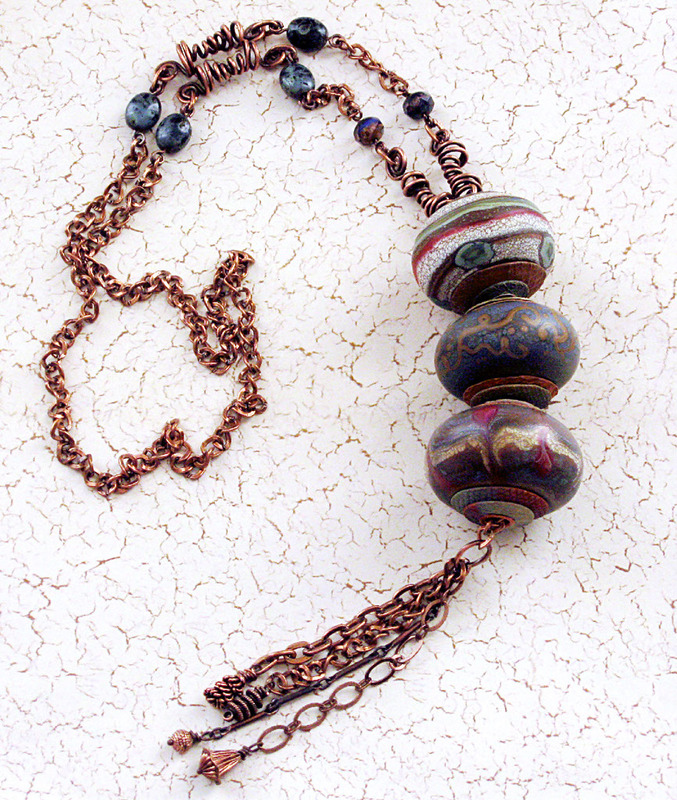 sets of beads and matching focals from a customer in California who saw my friend Cindy Wimmer's Fallen to Earth necklace in the new Wire Style 2 book and wanted to make one of her own with my beads. Thank you, Cindy! 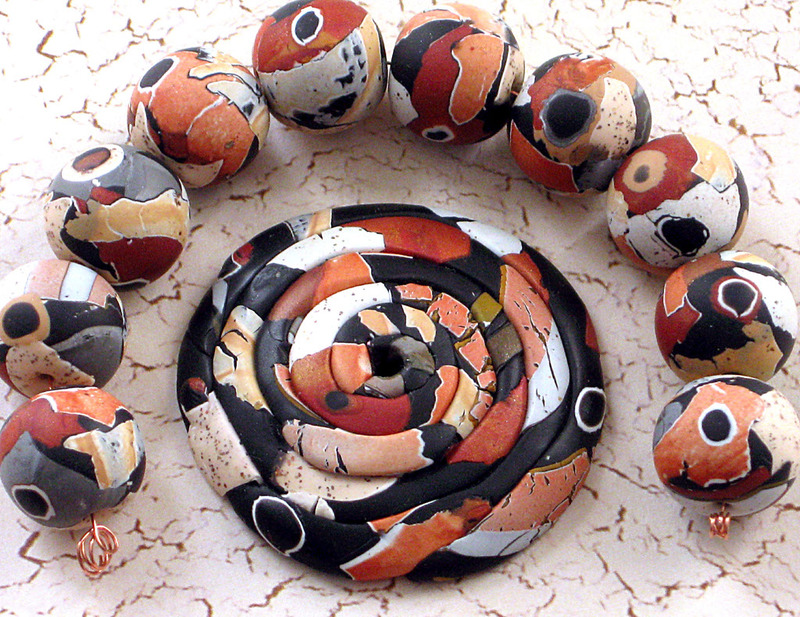 The customer said she thought designers should use polymer beads more in jewelry. I think so too! 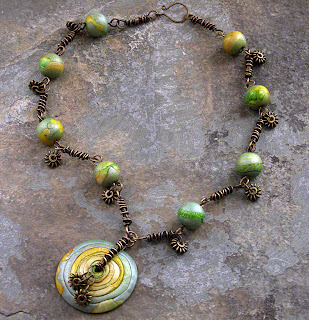 When I ended up with extra clay from making her focal, I decided to do my own version, substituting bronze wire for the copper Cindy used, since I thought it was more compatible with the green and yellow colors in the beads. Here are some of the focals and bead sets I did for my Etsy order. This past Sunday happened to be my birthday-- thank you Facebook friends who sent me kind greetings!-- and my sweet husband bought me these fabulous baubles from talented lampwork beadmaker, Aja Vaz, from Wandering Spirit Designs. You may remember that my sister gifted me one of her beads this past Christmas. Now I have three more! I was compelled to create something with them as soon as I opened my present and here's the result-- the Casbah necklace. I strung them onto a piece of copper chain and hung all three in a row, like a pendant-- they're very large—33 X 25mm-- and finished them off with a copper chain tassle with copper spacers to finish the ends. The metal matched the beautifully patinated copper metal clay end caps that Aja uses to finish off her beads so brilliantly! The fabulous baubles themselves - check out the cool beadcaps! ahhh,the winter thaw....I remember it so well. I love Vermont and was lucky to live there while in Nursing School, it is my favorite state. Christine,your jewelry is just beautiful! The clay beads stunning. The focals you made are all stunning, Christine - I can't even chose a favorite! Sending belated birthday wishes - all the best for you, may you be blessed with health, happiness, laughter, love and lots of inspiration!!! The beads your husband got you are fabulous! I have to say that I let out a little gasp when I saw what you made. I love the swirls and soft pretty colors of the spring necklace. Like new buds pushing out of the tips of the tree branch fingertips reaching toward a sun through gray flannel skies! Your pieces, your jewelry, your beads and your writing always speak to me in quiet and magical ways. Thank you for sharing this bit of loveliness this fine day. Oh, darnit, I missed your birthday because I don't think I was on Facebook that day! Well, happy belated birthday to you! 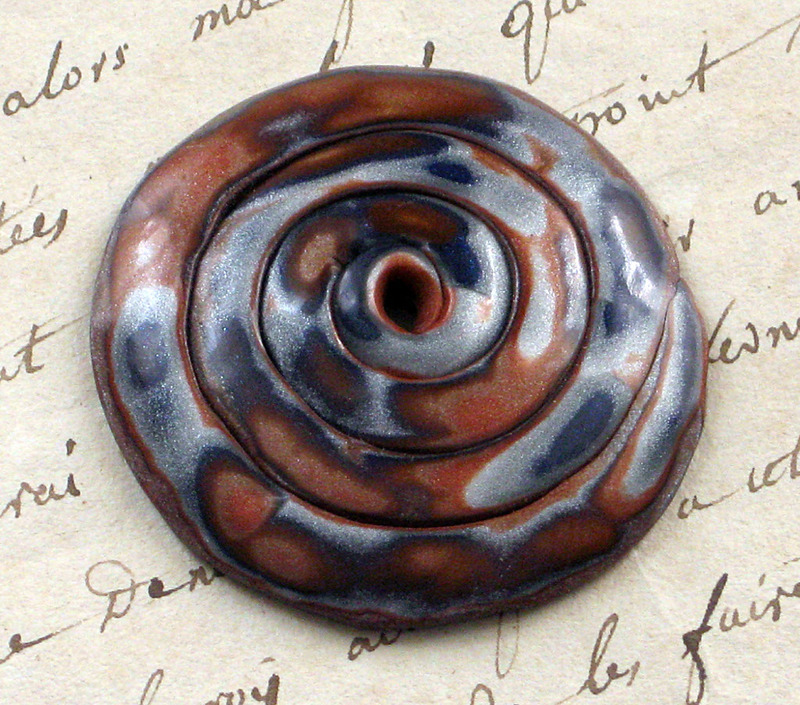 And of COURSE people should use more polymer clay. I think it's every bit as beautiful as lampwork, and the good stuff is equally as difficult to make. 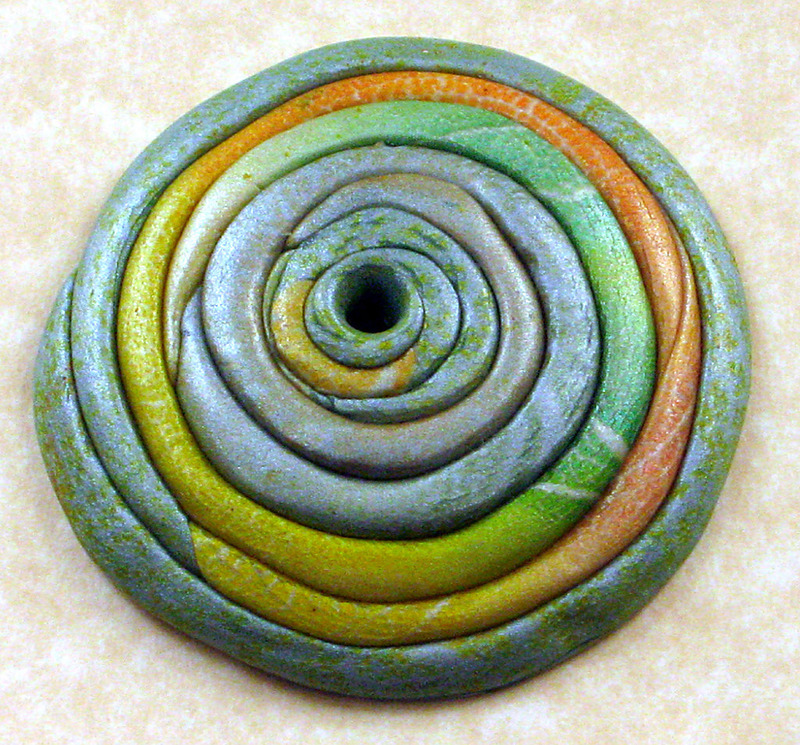 Every time I see Cindy's Bead Soup necklace, with your disks, I want to steal it, btw. You make the most wonderful beads in the world! Christine, I love the colors in Rite of Spring! You need to do more of these. I know you're a red/orange/yellow/brown kinda gal ... but this focal is so extraordinary! Great work! I've got to get that book! ton collier Rite of spring est une merveille!! 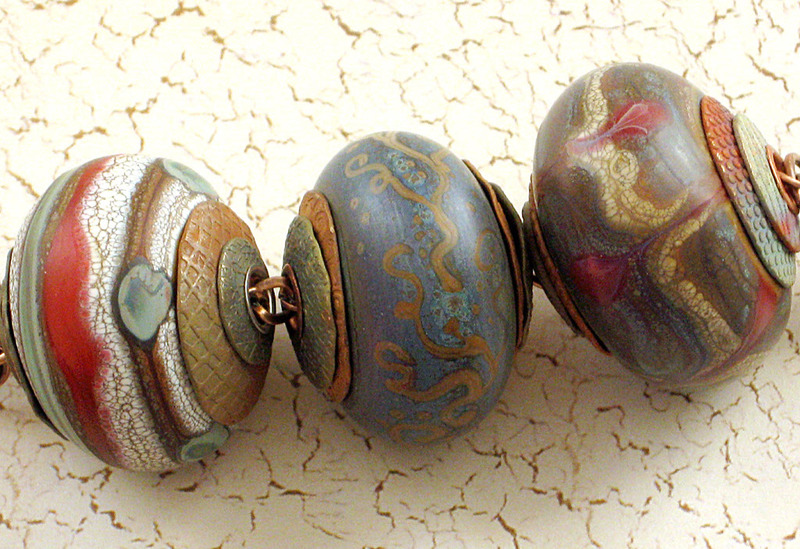 I'm so happy to find pictures of your custom bead sets here today! I wondered what you created, and now see you made 3 entirely different sets - each in their own beautiful color palettes. I just know your CA customer will love these. 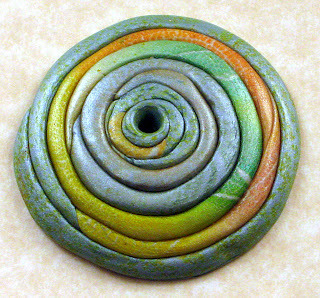 My favorite is Rite of Spring - I love the soft colors you used, especially mixed with the bronze. 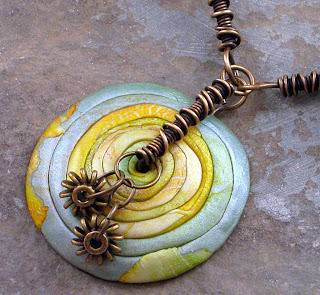 I agree, polymer clay components should be used more often in jewelry - as you show here, the results are knockout pieces of jewelry! These are just gorgeous. You're always so inspired by color...and it shows! Metals and beads make such a beautiful pair.they stand out with their independent property and make the creation innovation.Love your designs. I love everything about that necklace and those focals, nice work!! How the heck did your hubby buy beads from Aja, there's rarely anything of hers for sale that I can find!! Love her stuff, you lucky duck!! Happy belated birthday!